Codestone provides SAP Business One, market-leading accounting software which allows businesses to make the step from a basic financial accounting package to Enterprise Resource Planning. We know there are two things that cause an organisation to change its financial software – growth in turnover, transactions and people means that you can no longer operate finance as a silo; it needs to be integrated into the end-to-end operation. The second driver is usually complexity; multiple business units, operating countries, currencies and tax requirements have taken you beyond the capabilities of your existing solution – and that’s where we can help. SAP Business One not only provides you with a comprehensive accounting solution, it enables you to place finance at the heart of your business. Information is captured at source, processes are linked and you gain full visibility of your complete operation. SAPs Accounting software provides you with a way of managing your business accounts including journal entries, accounts receivable and accounts payable, as well as accurately tracking cash flow, fixed assets and monitoring performance against budgets. Accounting with SAP Business One shows a user-defined chart of accounts that truly represent your business. Accounting with SAP simplifies your banking tasks by fully integrating these into your financial applications. You can quickly process reconciliations and process payments whether these be by payment card, cheque or electronic funds transfer. Integrated financial management means far greater accuracy on cash-flow. Whether you have international operations or source products from international locations, an Accounting solution from SAP has this covered. SAP Business One supports multi-currencies and enables you to manage separate entities against the accounting and taxation rules of that country. SAP Accounting software makes international business easy and simplifies the task of compliance. As companies grow, accurate budgeting and management of these budgets is essential. Accounting through SAP Business One enables you to define your cost centres and create budgets for each one including user defined cost allocation rules. These budgets can then be allocated on both a monthly and annual basis with real-time tracking of performance against budget. A SAP Accounting solution enables you to accelerate the month-end close process. Having all of your financial and operational data in a single place, and available in the cloud removes the challenge of compiling month-end data. SAP Business One also enables you to assign tasks to individuals or create reminders to complete each aspect of your close process. 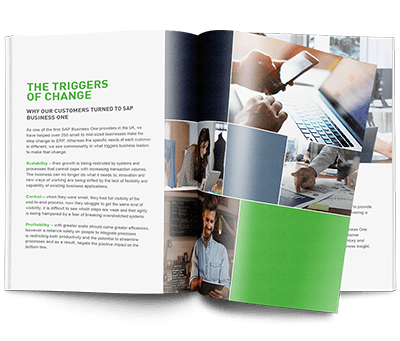 With accounting software from SAP you manage your accounts in a way that represents your business operations, with reports providing you with the information that truly matters. Furthermore, Accounting through SAP Business One lets you manage financials in real time. Accounting with SAP Business One puts financial management at the heart of your business. With information captured at source and held within one solution, you significantly improve both the consistency and accuracy of your financial data and financial reporting. Through linking financial management to all parts of your business, you have insight and control over every element that contributes to the profitability of the company. With data captured, processed and reported on in real-time, your accounting manages the ‘now’ improving cash-flow management, stock management and control of budgets. We call this ‘Run Live’.